I'm having a really weird issue where only my previously selected theme will load, so when I go to ANY others (I use HUD Machine Green Topshell) my theme just goes to the basic Windows 10 color scheme unless I go back to HUD Machine Green Topshell. I've already uninstalled and reinstalled everything needed to get the themes to work too, just in case that would somehow fix the issue and nothing's changed. I would love to switch to this version of the HUD Machine series if I can get this figured out. What are you doing exactly to switch themes? The way I got it to work last time, by changing the active theme in the old Personalization settings window. 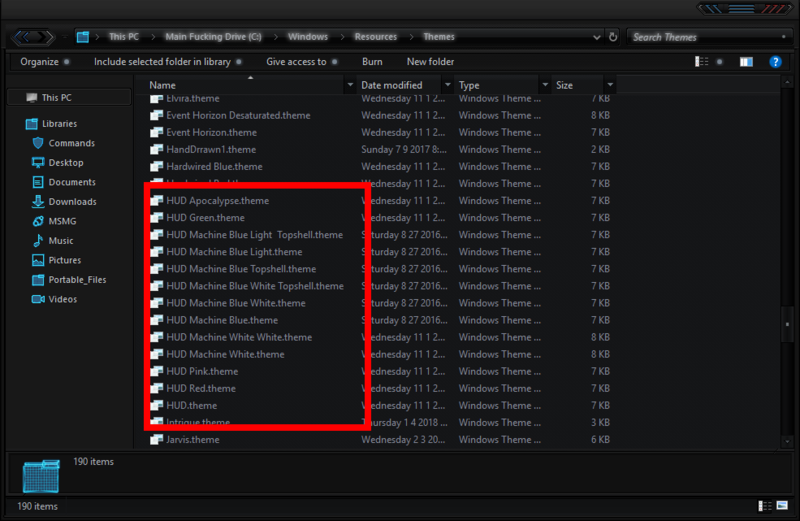 I have a copy of the themes folders in the system themes folder and that's how it worked for me with HUD Green, but only green topshell (as in the one called green topshell, not white or lite topshell) theme would apply last time. It's still the only one that will work and I've tried various others on this site for Windows 10, too. In the \Windows\Resources\Themes folder I have this, and all works. 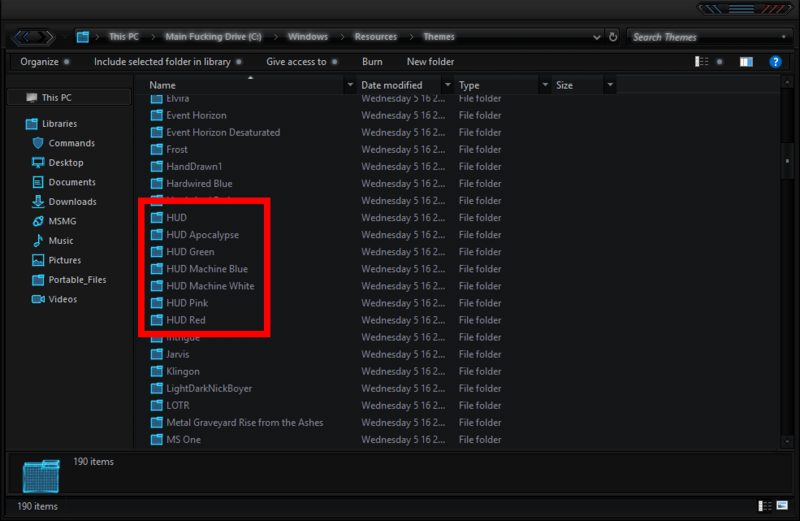 Check to make sure you have all the files, and folders there. I have posted screenshots below. Yeah, that's how I have mine too but only one of them works for some reason. I mean, one is better than none, I'm just not sure why. EDIT: Huh ok, so after the update that just launched yesterday I tried again (deleted the folder and themed I'd added to the Themes resources folder and re-added them) and it's working. Now to wait for StartIsBack to update and I'm golden (pun not intended)! Last edited by pidgetpn; 05-22-2018 at 03:54 PM.